Jackson Beck played announces on the Adventures of Superman, Bluto on Popeye cartoons, and, for over 20 years, the voice of Little Caesar Pizza. I liked Jackson Beck whenever he used his satanic, menacing "Bluto" voice in some episodes. Beck did the voice of Popeye's nemesis in Popeye cartoons that were released to theaters from 1943-1957. He also did the voice of Brutus in the syndicated TV Popeyes that were originally broadcast from 1959-1962. He was in some excellent productions. 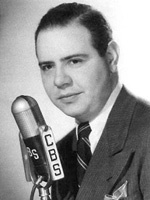 Jackson Beck, one of radio's distinctive voices. Seems like he always played a hardened criminal. Great voice!